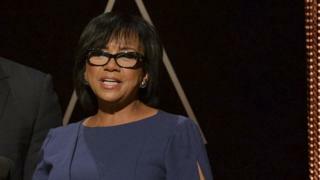 Image caption Boone Isaacs said she would "conduct a review of our membership recruitment"
Oscars head Cheryl Boone Isaacs is taking action to "alter the make-up" of their membership, after Spike Lee and Jada Pinkett Smith's refusal to attend because of the mostly white nominees. Lee said on Instagram he "cannot support" the "lily white" awards show. The 6,300 members, made up of people from the film industry, vote on who is nominated for the Oscars each year. She said such a move was not "unprecedented" for the Academy, and that in the 60s and 70s younger members were recruited and that today's mandate was about inclusion: "gender, race, ethnicity and sexual orientation". Media captionJada Pinkett Smith: "Begging for acknowledgement... diminishes dignity and power"
Boone Isaacs has also tried to make the show on 28 February more diverse, bringing in black comedian Chris Rock to host. This is the second year in a row there have been boycott calls, sparked by a list of nominees that is mostly white. In 2012, the LA Times conducted a study to find out how diverse the Academy membership is. Reporters spoke to thousands of Academy members and their representatives to confirm the identities of more than 5,100 voters - more than 89% of the voting members. Oscar voters are nearly 94% Caucasian and 77% male. Black members make up about 2% of the Academy, and Latino members less than 2%. Oscar voters have a median age of 62. People younger than 50 constitute just 14% of the membership. Some of the Academy's 15 branches are almost exclusively white and male. Caucasians currently make up 90% or more of every Academy branch except actors, whose membership is 88% white. Men make up more than 90% of five branches, including cinematography and visual effects. Among those overlooked for this year's Oscar nominations were the NWA biopic Straight Outta Compton for best picture and Pinkett Smith's husband Will Smith, for best actor in NFL film Concussion. She and Lee made their announcement on Martin Luther King Jr Day, a national holiday in the US to remember the civil rights leader. "Forty white actors in two years and no flava at all," said Lee. "We can't act?!" Hollywood trade paper The Wrap spoke anonymously to some Academy members, many of whom applauded Isaacs' comments. "They're not embarrassed today," one Academy member and former governor said. Another member said: "The problem is not the nominations. It's the make-up of the Academy, and more than that the make-up of Hollywood." Another said: "The irony is, if Hollywood is not open to diversity, then we're in real trouble as a country, because Hollywood is supposed to be liberal and open." But others were sceptical: "Any way you slice it, it's a knee-jerk reaction," one member told The Wrap. Speaking on Radio 4's Today programme on Tuesday, Doctor Who actor Colin McFarlane, said of Lee's decision to not attend the Oscars: "You've got to be at the party to change the conversation but I completely understand the frustration - black actors are being written out of history. "The game is changing and I think it needs to change on both sides of the Atlantic - the Baftas and the Oscars - and there should be more women. "(Black) kids need to see themselves on TV and in the movies." Last year, there were similar calls to boycott the Oscars ceremony but Lee and Pinkett Smith are the first high-profile figures to carry out the threat. Neil Patrick Harris presented the show and the audience figures were down 16% to a six-year low. The hashtag "OscarsSoWhite" was heavily used after Thursday's announcement. The Reverend Al Sharpton said: "Hollywood is like the Rocky Mountains, the higher up you get the whiter it gets and this year's Academy Awards will be yet another Rocky Mountain Oscar." Media captionIdris Elba has described the American Dream as "the most famous diversity policy of all"